Tequila and Mezcal lined up for Margarita making. It was the closest Saturday to the real Cinco de Mayo, which fell during the week this year. Gregg, a publisher and editor of beer and spirits newsletters and magazines, has access to lots of brands and flavors that you and I may never see. It was easy for him to offer almost infinite variety for this traditional May drink from Mexico. 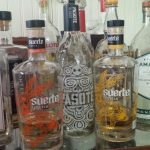 Tequila is a type of Mezcal, a spirit distilled from the agave plant grown in mexico. As Gregg explained it, Mezcal is the patriarch at the top of the family tree. It can be made from any agave or blend of agaves grown anywhere in Mexico. 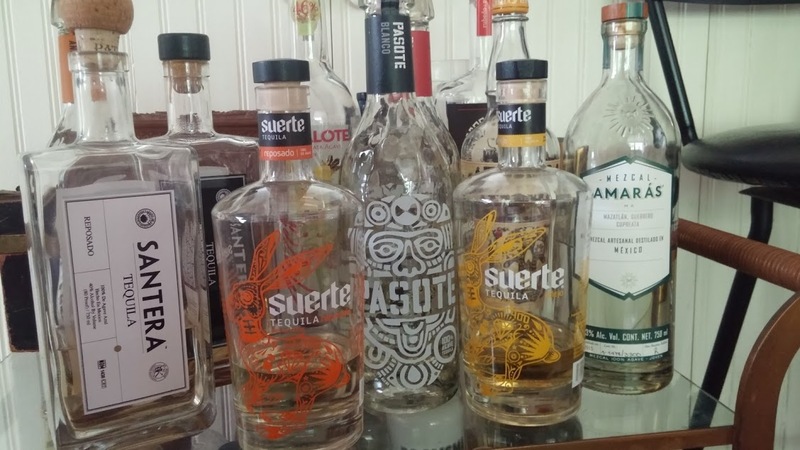 Tequila, on the other hand, is made only from the blue or Weber agave mostly from the state of Jalisco in three different styles: White or Silver tequila is bottled right after distillation; Reposado is aged for up to a year and usually has a light amber color; Anejo is aged even longer, and has more color. As the Tequila ages it acquires some flavor and complexity from the barrel. A margarita is essentially a Tequila sour. Sours, and particularly whiskey sours, were the gateway cocktail for baby boomers. Tart with lemon, foamy on top, and slightly sweet they were served either on the rocks or up in a special stemmed glass. The punch of the whiskey was masked by the other ingredients for an easy sipping introduction to drinks. 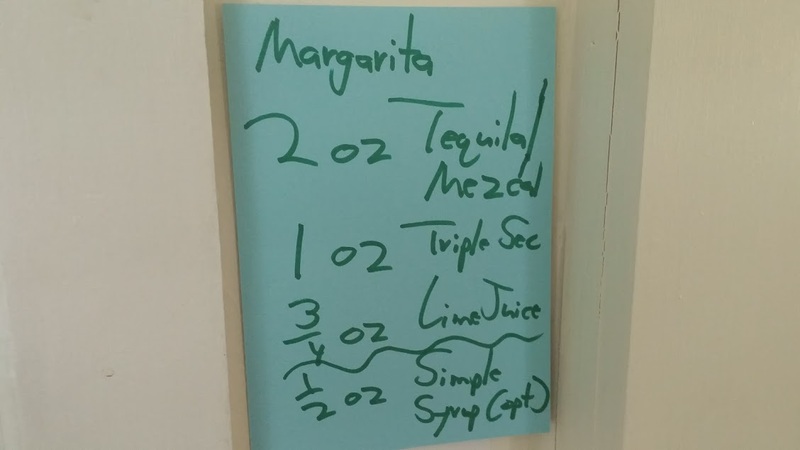 Gregg’s Margarita recipe taped to the wall for ready reference. The family of sours is described in the May 2016 issue of Bon Appetit on a flavor wheel that includes Daiquiris, Mojitos, Cosmos, Kamikazes and the French 75, in addition to Margaritas and whiskey sours. The base recipe, from Audrey Saunders of the Pegu Club in New York, is 2 oz of liquor, ¾ oz sweet and ¾ oz sour, each drink with its own blend of the three flavors. Gregg’s recipe was a little more robust: 2 oz Tequila, 1 oz liqueur, 3/4 oz lime juice and sweetness to taste. On the advice of a master bartender friend, the mix was to be shaken seventeen times (no more, no less) and then strained into a glass over fresh ice. Margaritas, according to Restaurant-Hospitality Magazine, are the most frequently ordered cocktails in restaurants. 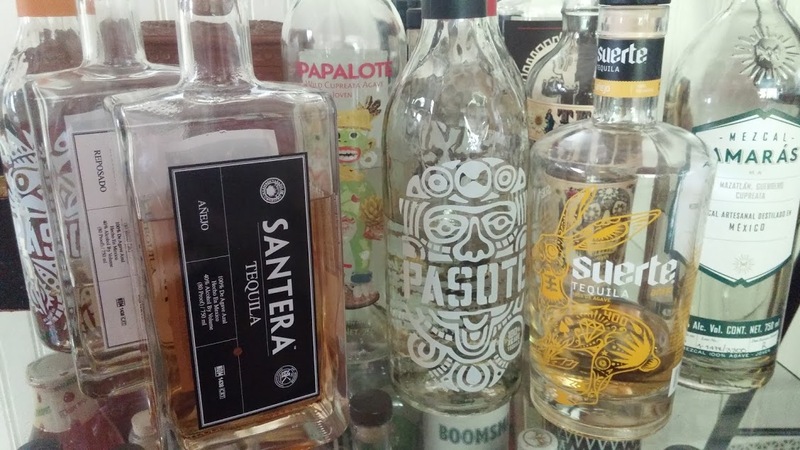 Step one was to choose your spirit – Mezcal or Tequila – from the lineup of bottles on the bar. Like all spirits, these are marketed partly through their bottle and label, each sending a message about what might be in the bottle and trying desperately to appeal to you more than the one standing next to it on the shelf. Most are at 40% alcohol, but a few are higher. Margaritas are traditionally made with triple sec, a clear, orange-flavored liqueur. With a French heritage, it’s now widely copied around the world. I stuck with tradition. 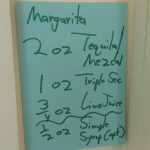 Gregg was pouring Drapers triple sec (Total Wine), although in today’s world bartenders have a wide range of flavors to work with and are trying almost anything. 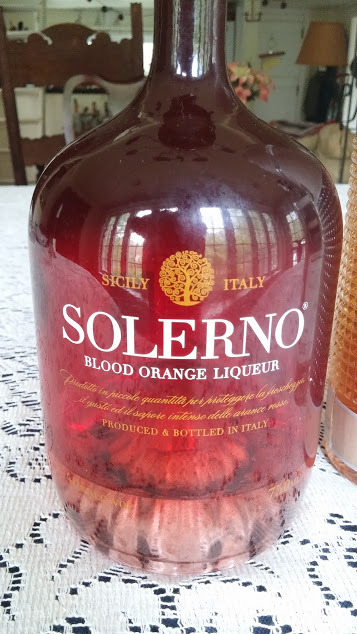 For my second margarita, I tried Solerno blood orange liqueur from Sicily. (New Canaan Ave Liquors or Rowayton Wine Shop). Not quite as sweet as the triple sec, with a much more distinctive and complex flavor, it made an excellent drink. 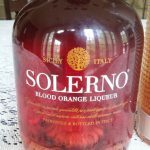 Despite the reddish orange color of the bottle, it was clear, too. Sweetness is an issue. The cordials add sugar, but the level varies from brand to brand. My first drink, without added sweetening, was teeth-etching tart. A squirt of simple syrup took care of that. The second drink was too sweet, overcompensating from the first, I guess. More lime juice would throw off the balance, so I drank it as is. I was looking for adventure in my third Margarita. (Disclaimer: I shared this one with my wife, so I’m only accountable for two and a half of these potent drinks.) 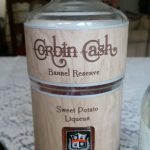 In the back row of cordials a tall slender textured bottle with a tan label read Corbin Cash Barrel Reserve and below that in discretely smaller type, Sweet Potato Liqueur. An irresistible taste challenge. (Souza family farm in California’s San Joaquin Valley – not available outside CA, get a friend to send you some.) 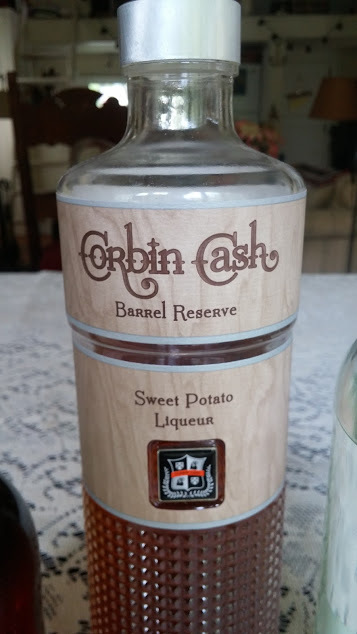 A sniff and a sip revealed a slightly vegetal aroma of potatoes in the field and flavors from the best that sweet potatoes have to offer – pretty good stuff and not too sweet. “Mix it up,” I told Gregg. This one was the best of the bunch – not too sweet or tart, with a delightful match of the agave and potato flavors. I actually think Marsha got more than her half of this easy-drinking version. The cocktail craze is on! Just look at any restaurant drinks list. Exotic, colorful, unique, and even crazy combinations are poured into every shape of glass – up or over ice. Don’t be afraid to jump in with all your taste buds. You may find your new best favorite. You can reach Frank Whitman at NotBreadAlonefw@gmail.com. Previous Article From The Hour: Let’s do Brunch!